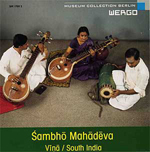 Dedicated to vina, the reference instrument of the Carnatic music in South India, this issue from the collection of the Berlin Museum constitues a reference in the matter : quality of the performers and quality of the documentation give evidence. A must ! "South India Nâgaswaram in the Carnatic tradition." In Kerala, the large oboe nâgaswaram is, first of all, an instrument of the temple music. 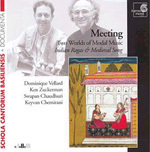 In this CD, O. K. Subramaniam performs carnatic music : the classical tradition of South India, in an innovative and yet traditional style. Innovative, because the artist adapts with an exquisite finesse his instrtumental technique to a repertoire which is unfamiliar with this instrument, and traditional in his choice of ancient compositions and improvised forms which are hardly performed any more. 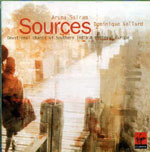 "Sri Lanka : maîtres-tambours guérisseurs"
After exploring the affinities with the music of Souyh India (see below SOURCES), Dominique Vellard continues to work on the affinities between the medieval music in Europe and presently the musical traditions of North India. 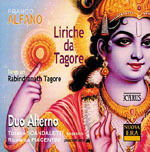 In this highly unusual recording, two superb singers explore the affinities between the ancient chants of their respective civilizations. While respecting to the full characteristics inherent in each tradition, they chose the music with great care so to bring out genuine kinships, resulting in juxtapositions of exquisite aptness and beauty, in performance remarkable for their technical mastery and warmth. 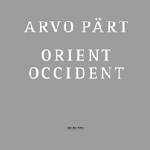 The latest ECM release of music by the Estonian composer Arvo Pärt takes its title from the shortest work on the disc, Orient Occident, composed in 2000 for string orchestra. Tinged with Eastern musical motives, the texture constantly alternates between rich harmonies and unison sections. The CD opens with Pilgrim's Song, Pärt's tribute to his friend, the Estonian film and theatre director Grigori Kromanov. The work was written in 1984 for male voice and string quartet but it is the 2001 version for men's choir and string orchestra which is heard here. Based on Psalm 121 ("I will lift mine eyes unto the hills…"), Pilgrim's Song explores, as Pärt explains in his sleevenote, time and timelessness. The mellifluous vocal writing contrasts with a heartfelt mourning figure for strings. Como cierva sedienta (1998)--a five-movement choral drama for soprano, women's choir and orchestra--is the most substantial work on the disc. It begins in familiar Pärt territory--sustained voices, a tolling bell--before the orchestra begins to unfold. Some of the music which follows is almost filmic with its blazing trumpets and stratospheric vocal writing.